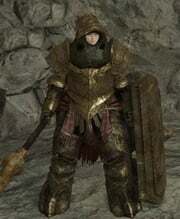 Mastodon Set is an Attire or Armor in Dark Souls 2. Armor sets do not provide specific benefits, so players are free to mix and match their preferred parts to optimize their Builds. "Helm/Armor/Gauntlets/Leggings worn by the Primal Knights of Drangleic castle. Their weight would normally crush a man, but the Primal Knights wear them as if they were silk, so fearsome is their brutal strength. The King restored a forbidden, long-lost art to create these inhuman abominations." Dropped by Primal Knights at the entrance and inside of Drangleic Castle. [Scholar of the First Sin] Primal Knights are only found at the entrance. Leggings offer second highest physical defenses – the highest among armor pieces upgraded with regular Titanite. Other best pieces are: Gyrm Warrior Greathelm and chestpiece, Steel / Drakekeeper / Mastodon gauntlets and Alonne Knight leggings. Leggings also offer second highest poise (almost equal to that of Looking Glass and Smelter Demon leggings). The entire set is worn by Steel-willed Lorrie, an NPC summon in Old Iron King DLC. There's also Rusted Mastodon set that's dropped by the same Primal Knights in Doors of Pharros. This set is ~10% lighter and ~20% worse in all stats. Why is poise 0 on stats total? The chest piece, leggings and gauntlets remind me of the god emperor of mankind from dawn of war, the emperor shall protect those that dawn his holy image. I was able to obtain a pair of these leggings from an enemy within the Doors of Pharros.